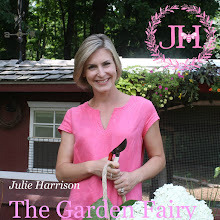 Julie The Garden Fairy: Everybunny Will Love This! The table is set. The ham is in the oven. The flowers are in place. The chocolates are hidden until the hunt. You can finally rest and enjoy your Easter Celebration- or can you? Avoid that awkward pause around the dining room table as your guests try to figure out where to be seated with these place ‘cards’. This egg isn’t dyed, it’s just fresh from one of the hens here on the farm and hard boiled. If you are looking to add more color to the table you can dye them first, but please keep the colors soft. Just a drop or two of food dye diluted in a white vinegar-water mixture will do the trick. I find nothing worse at Easter than those neon kit colors that grocery stores sell. I used a permanent marker to write the names onto the eggs. Place the egg in a small terracotta pot- and done! Just another EGGcellent idea of Natural Elegance!